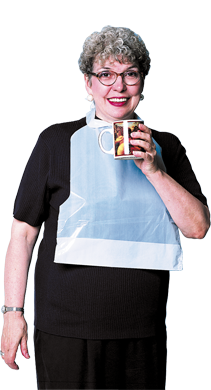 Polyethylene disposable aprons opaque white with attached ties. Same as AP-100 in blue. Extra heavy duty 20 mil vinyl green apron. Can be used for the toughest jobs. Puncture and tear resistant. Withstands a broad range of chemicals. Size: 35 x 45. Same as AG-100 but white in color specially designed for the food processing industry. Same as AG-100, in 8 mil white. also available in green. Chemical and solvent resistant hycar apron with cloth backing for extra strength. Size: 35 x 45. Also available in white for the food processing industry. Available in black & white. The ideal shop apron. 12 oz. blue denim, 4 metal groumets, serged edges, bib swing pocket, 1 side pocket, size 27 x 36, other sizes available. We can custom make other pocket arrangements to your specs. 18" heavy duty 12 oz. blue denim sleeves, elastic top, knitted wrist. Heavy gauge 8 mil vinyl sleeves. Seams are electronically sealed to eliminate any leakage. Elastic top and wrist, 18" long, also available in 24" long. Color: clear or blue.